Congratulations to the competition winner Julie Dickens. The 2013 FA Cup Final kicks off next Saturday and Wigan fans are making their preparations for the huge Wembley clash. 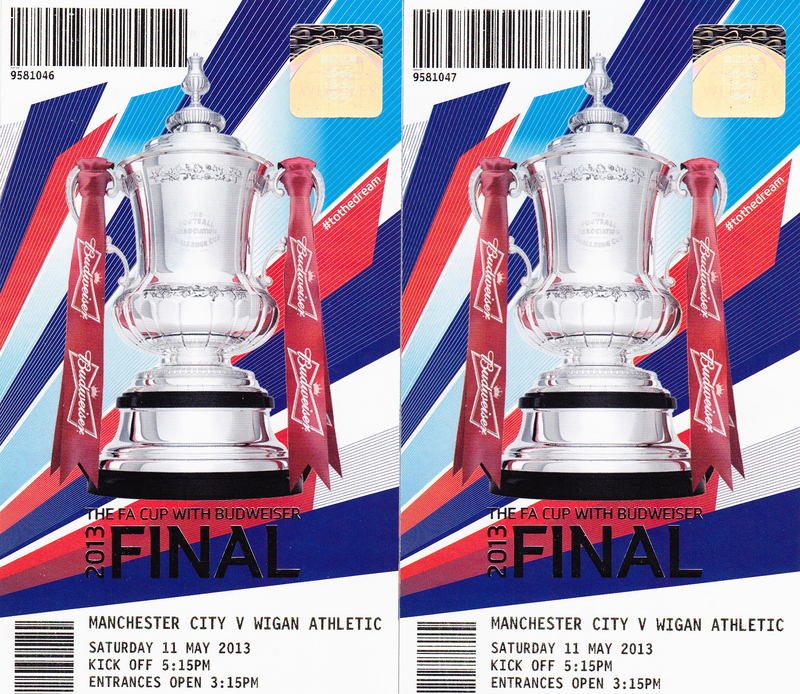 This year’s match is the 132nd final of the FA Cup, the world’s oldest football cup competition, and sees Wigan Athletic take on Manchester City at Wembley. This is the Latics first ever appearance in an FA Cup final since their formation in 1932 and also means that they have qualified for a Europa League place next season. It’s sure to be a big day for the team, but the pressure is on the Latics to provide some FA Cup glory after a season of battling relegation. Since Dave Whelan took over the club in 1995, however, the side has gone from strength to strength and what once seemed like an impossible dream is now a reality as the Latics prepare to play the showpiece final. And you could be there to experience the Wembley atmosphere and (hopefully) celebrate this historic moment. We’ve teamed up with FootballScores.com and Winner.com to give one lucky fan a pair of tickets to the FA Cup Final next weekend. Who did Wigan beat in the semi-final of the FA Cup to go on to the final? THIS COMPETITION IS NOW CLOSED & THE WINNER HAS BEEN CONTACTED. For all the Latics news and views follow @IanHAspinall and for live football scores and updates, follow @footballscores_ or like their Facebook page. This entry was posted in FA Cup, Manchester City, Wembley, Wigan Athletic and tagged FA Cup, Manchester City, Wembley, Wigan Athletic. Bookmark the permalink.